It’s a good idea to invest (smartly) when you’re young! This is Risk Mountain. It represents the different ways you can “hold” your money, and even make money instead of just sitting on it. Risk mountain sinks into the ground at the rate of inflation, averaging somewhere around 3 %. 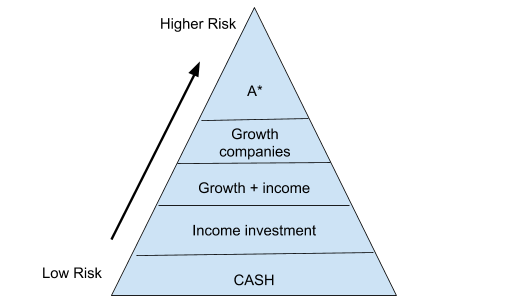 The bottom of risk mountain represents your cash holdings: there is no risk involved, but you also aren’t making any money. If you invest your income in a fairly stable company that isn’t growing, then you will often receive dividends (profit-sharing) in proportion to your stock share. Some growing companies also operate this way. However, many growing companies hold onto their profits and reinvest that revenue into the company; you receive your profit when you eventually sell your stock. → “feed” monthly: invest a part of your paycheck monthly – it won’t affect you too much now, but will pay off later! It’s often smart to buy when everyone is selling (dip in markets). → don’t buy into hype of fluctuating markets, sometimes it’s good to hold out. When you secure your first job, your employer will likely offer you a health insurance plan. They will likely have a few plans that you can choose from. Here we provide a bit of information about some typical types of health insurance plans and some tips for making sure you get the best healthcare possible. Be Informed: Read all the information your employer provides and ask questions! Check your medical bills with your insurance statements – they should match! coinsurance), and a lower deductible. pay less out-of-pocket per medical visit (higher coverage). care), and a high deductible. you’re getting the most cost-effective care. *All health plans have an annual out-of-pocket maximum. Who has to file income tax returns? A credit score is a statistical value that assesses an individual’s creditworthiness in an attempt to predict the likelihood that they will pay back a given loan. The credit score ranges from 450 to 850, with a higher value generally indicating a higher degree of trustworthiness. Credit scores are extremely important as they are essential for individuals to take out any kind of loan including for a house, car, etc. Some employers will even look at an individuals credit score if they are between to candidates to assess an individual’s level of fiscal responsibility. Credit scores are calculated based off of a wide range of factors, however the best way to build credit effectively is through opening a credit card account and using it wisely. By opening a credit card account and paying off the full amount each month, you are demonstrating fiscal responsibility, thereby building your credit. Having auto and property insurance is vital to protecting your assets and your financial future.